Tomorrow the Vietnam Solidarity Campaign’s demonstration against the Vietnam war is due to take place in London. Many coachloads of protesters are travelling down from Liverpool. 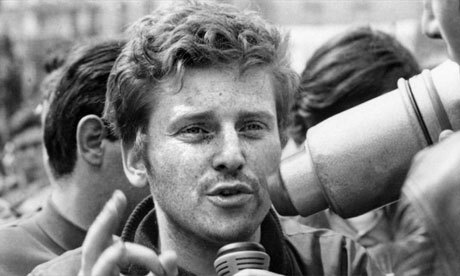 Tory politicians and the right-wing press have stoked up an apocalyptic atmosphere in advance of the demonstration, one strand of which has been hysteria about foreign agitators, such as ‘Danny the Red’ (Daniel Cohn-Bendit). I beg to move, “That leave be given to bring in a Bill to amend the Public Order Act 1936 so as to provide for the identification, imprisonment and subsequent deportation of persons other than Her Majesty’s subjects and of alien militant agitators taking part in, or conspiring in the preparation of, lawful public demonstrations.” The object of my proposed Bill is to limit to the people of this country, to Her Majesty’s subjects, the right of lawful public demonstration in this country. The Bill would make aliens who conspire in the preparation of such demonstrations or take part in them liable to prosecution and, on conviction, imprisonment and deportation. The Bill would not take away from aliens the right of political asylum here. It would take away no right from any British subject. The right to organise lawful demonstrations would not be curtailed. Indeed, it would be protected from the hostility which it attracts from the public at present because of the presence at lawful demonstrations of alien militant agitators. I give an example which was reported in Hansard on 4th April. It is a description by the officer in command of the police of what happened at the end of the demonstration in Trafalgar Square on 17th March, when the demonstrators had moved off to attack the United States Embassy in Grosvenor Square. The officer in charge stated: “The German contingent were particularly militant at this stage and occasionally halted in the roadway until there was a clear space ahead, then, holding their banner poles horizontally with each man in the front rank gripping a pole with both hands, they ran forward in step chanting ‘Seig heil’ “. “Both footways in Regent Street were crowded with pedestrians in an attempt to get out of the way, many being obviously cowed.” I have always regarded it as one of the chief glories of the House that we should see to it that the people whom we represent are not cowed on a Sunday afternoon in Regent Street, or anywhere else, ever, by militant German contingents running forward in step and chanting, “Sieg heil”. The people whom we represent are prepared to put up with a lot from their fellow countrymen, though their tolerance is now being stretched to the limit. 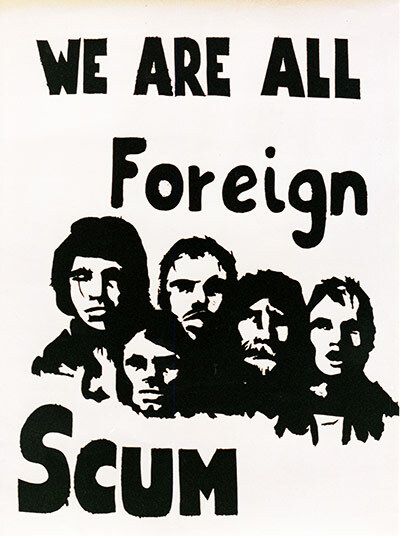 The British people are fed up with being trampled underfoot by foreign scum. [Hon Members: “Shame.”] The House would do well to recognise the seething resentment and anger of the people whom we represent at being offered as a sacrifice to alien militant agitators with no true cause. He is trying to create trouble on Sunday. I say with no true cause because however hard one tries to discern a true cause or a noble ideal which may be said to inspire the alien element in such demonstrations as that planned for Sunday, it is very difficult to find it. The chairman of the March 17th Ad Hoc Committee [Tariq Ali] which organised the riot in Grosvenor Square wrote to The Times on 21st March boasting that his next riot would be even bigger, while claiming that he was not actively encouraging and planning the use of violence. That same chairman is the editor of a fortnightly publication [Black Dwarf], the current issue of which devotes some space to the organisation and preparation of next Sunday’s demonstration. The editorial, on page 2, is headed: “Students must make revolution”.” The “Diary of Events”, on page 4, gives the editor’s programme of visits to various universities manifestly in connection with organising this demonstration, and there is no harm in that. This publication at this time may not unfairly be cited as the fountain of inspiration which moves alien militant agitators to come to this country, as the editor puts it, “to make revolution”; those are his words. What is the message? On page 5 of the publication we have it. It is described by the editor as the answer made by “an organiser” of the Columbia (United States) University “rebellion” of students, to the charge made against him of nihilism. The answer is encapsulated in one sentence from the text which follows and that one sentence is extracted by the editor and printed as the headline in anticipation of Sunday’s demonstration. It reads: “Up against the wall, mother fucker. This is a stick-up’.” Some might criticise the language as being rather callow and immature, but the House and those with responsibility for the security and well-being of decent, quiet-living constituents must criticise the message itself in substance as nothing but destructive aggression. If this is the quality of the revolutionary leadership specifically imported from abroad to cow Londoners on Sunday—[Interruption.] I am quoting the actual text of the publication which constitutes an invitation to these people to come here and make revolution. If this is the quality of the agitators who are being specifically invited here on Sunday for this purpose, I put it to the House that this is one of the imports which this country might just manage to do without. But if we are to have such imports […] if these are the imports which are being invited, they are imports that we could do without, and that people from America or Germany, or wherever it may be, who try to provoke our constables because we show them a tolerance which they would not show to others if they had the revolution which they want, should not be allowed to come here for this purpose. I therefore ask leave for the Bill to be introduced so that the liberties which we properly defend for our own people should not be abused and brought into disrepute by others brought into this country specifically for the purpose of provoking the police and causing public destruction. The Bill could easily be got through all its stages if the Government had a mind to allow it before we rose on Prorogation. The hon. Member for Ilford, North (Mr. Iremonger) has advanced an absolutely monstrous proposition. I can well understand that he should have done so in the form of a Ten-Minute Rule Bill, because that was the only way in which he could get away with a speech such as that to which we have just listened. It would be almost too ridiculous for the House to pay any attention to the hon. Gentleman’s totalitarian theories, except that silence might be misconstrued as approval, and that is why I intervene to ask the House to oppose the Motion for leave to introduce the Bill. The only countries which have legislation of this character are the Communist or Fascist dictatorships, and I should like to quote two short examples. One is that of a young schoolboy, Stuart Taylor, who was arrested in Spain while on holiday there after being alleged to have shouted the word “Liberty” during a political demonstration. For this he spent two weeks in a smelly and uncomfortable Spanish prison before being bailed out by his parents at very heavy cost to themselves. The other example is that of War Resisters’ International, who went to Moscow recently to protest against the Soviet invasion of Czechoslovakia. Two young people, Miss Vicki Rovere and Andrew Papworth, were deported for the offence of giving out leaflets there. They were returned to the United Kingdom without having suffered any punishment of imprisonment, such as the hon. Gentleman is suggesting in his proposed Bill. These two examples, which could be paralleled by many others, show that only in dictatorships, under Communist or Fascist control, is this type of legislation permitted. It may be convenient for the hon. Gentleman that Sir Oswald Mosley is in London at this moment. The hon. Gentleman might be able to take his advice on how demonstrations could be controlled—a theme on which Sir Oswald has expressed himself somewhat forcibly in this morning’s papers—by treatment that would be more appropriate to Nazi Germany in 1936 than Britain in 1968. My second point is that the hon. Gentleman’s Bill, as I understand it, would be a contravention of at least two of the Articles in the European Convention on Human Rights. Article 10(1) provides that everyone has the right to freedom of expression, including freedom to hold opinions and to receive and impart information and ideas without interference by public authority and regardless of frontiers. Article 11(1) provides that everyone has the right and freedom of peaceful assembly and to freedom of association with others. We could not pass this Motion without committing a breach of the European Convention on Human Rights, which Mr. Harold Macmillan once described as the prior 1295 condition without which our society will fail. Thirdly, the Bill would be anomalous, because it refers to subjects of Her Majesty the Queen. That would mean that citizens of Canada, Australia, New Zealand, Ceylon, Sierre Leone, Jamaica, Trinidad and Tobago, Tanzania, Mauritius, The Gambia, Malta, Guyana and Barbados could come here and legitimately take part in these demonstrations, whereas citizens, for example, of Nigeria and Pakistan, which are republics, could not. Fourthly, I would point out that the Home Secretary already has power to deport aliens who have been in Great Britain for less than two years, without any right of appeal to the Metropolitan Chief Magistrate, and that even where an alien has been here for two years he can be deported without such an appeal if the security of the State is threatened. Commonwealth immigrants can also be deported within a period of five years if they are convicted of an offence punishable by imprisonment. My next point is that the hon. Gentleman’s Bill would seek to make the preparation of a demonstration an offence in itself. I always thought that if, under our law, an action was in itself lawful, then it could not be deemed to be a conspiracy to organise it. The hon. Gentleman is, therefore, committing a fundamental breach of our law. The Home Secretary already has power to stop the entry of aliens or citizens from the Commonwealth where he believes it is in the public interest for him to do so. It is quite reasonable for him to refuse entry in cases where persons have been convicted of offences involving violence during public demonstrations. That is a safeguard which the hon. Gentleman has neglected. No doubt inadvertently, by seeking to introduce his Bill at this moment, the hon. Gentleman is encouraging the very violence on 27th October which he purports to be trying to prevent. The more discussion there is of repressive measures being taken against lawful demonstrations, the more likely it is that unlawful action will result. So far, I am happy to say, both organisers and the police have taken a responsible line, and I very much hope that 27th October will pass off without any violence at all. I deplore violence as much as any hon. Member and I would appeal to editors of newspapers, and producers of television programmes, to listen more closely when peaceful protests are made, so that people do not say that the only way they have of getting the attention of Governments is by organising demonstrations which end with violence. If the Bill were allowed to go through the House of Commons unchallenged it would be the greatest affront to civil liberties in this House for many years. It would be an unsightly stain on the reputation and honour of this House, which has always, under every Government of whatever complexion, upheld the principles of freedom and justice. I hope that the Motion will be rejected by an overwhelming majority so that the hon. Gentleman will be made aware of the repugnance and shame that we feel at his monstrous suggestion. The House divided: Ayes 62, Noes 159. Degree at last! Good God almighty, degree at last! When exploring the threads below, bear in mind that the material here is organised as if, back in 1970, the Internet had existed and an eyewitness and participant in these events had maintained a regular blog, posting notes on key events, extracts from newspaper reports, documents and photos. Posts, backdated to the date of a particular event or source material, therefore appear in reverse chronological order, most recent posts at the top of a page, earlier ones below. An extract from "In Living Memory" about the 1970 student protests, broadcast on BBC Radio 4, can be heard here. An emotional involvement Blog at WordPress.com.